The early arrival of cold weather has brought up hopes of outdoor ice skating before Christmas – always an iffy possibility, since it requires both enough cold weather and not so much snow that ponds are unskateable. I’m going to the Everett Arena in Concord this afternoon to get our ice skates sharpened, just in case. When you ice skate at the Everett Arena, you’re actually skating on 3,000 gallons of very cold brine. Not quite literally, I’ll admit: Plain old city water, in frozen form, is beneath your blades. But what makes that possible is very salty water at 16 degrees running through 10 miles of pipes under the arena’s concrete floor. Actually, 16 degrees is pretty toasty compared with what happens in the compressor room, next to where you get your skates sharpened. “It’s 14 degrees when it enters the pipes . . . and it’s got to be 10 degrees cooler in the chiller,” said Everett Arena Manager Jeff Bardwell, speaking between the crash of pucks and bodies hitting the boards as hockey players warmed up. The 51-year-old arena (it’s now 53 years old) recently switched over to skating following the end of the summer event season. I was curious about exactly how all that ice is made and maintained, and Bardwell gave me a tour. Salty water has a lower freezing point than regular water, so by mixing 23 percent salt – about seven times as salty as the ocean – you turn water into brine that stays liquid and will move through pipes even when cooled far below 32 degrees Fahrenheit. And I do mean far below. 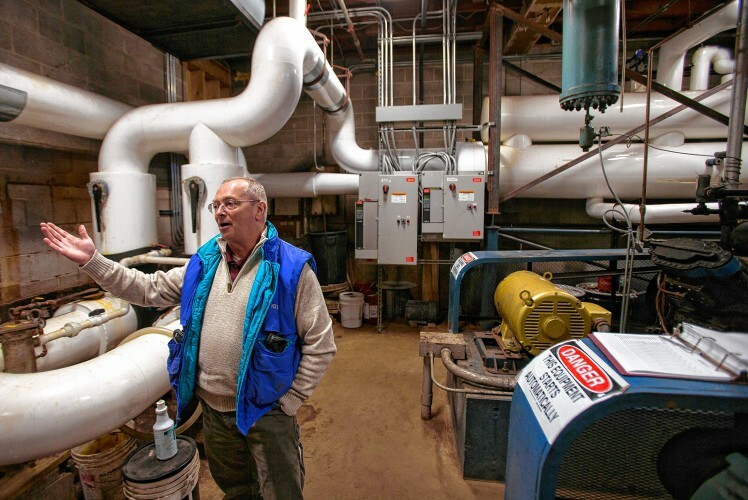 In the Everett Arena, a pair of 75-horsepower compressors chill that brine to as low as 4 degrees, then send it out under the floor through pipes made of a special plastic that won’t shrink as the temperature changes. The cold radiates (or the heat dissipates, whichever you prefer) upward through the concrete to the roughly 1½ inches of ice that we skate on. The goal, Bardwell said, is to have the ice surface at 20 degrees for hockey players, or 22 degrees for figure skaters, who like it a little softer. Warming up ice for the figure skaters is relatively easy with Zambonis, which use hot water in their rounds because it binds better to the existing ice. But cooling the rink down 2 degrees for hockey is much harder, which may explain why Bardwell didn’t seem too upset that there isn’t a figure-skating club in the arena’s schedule. The compressors and pumps have to fire up occasionally during the day to keep the ice at the right consistency, but all this depends on many variables. It’s an art as well as a science for the ice manager – including the folks who get to drive the Zamboni – to keep things good. As you might expect, this cooling takes energy. Last fiscal year, Everett Arena used 369,000 kilowatt-hours of electricity, roughly the amount used by 45 standard houses. The arena is probably the third-biggest power user in Concord city government, behind only the wastewater and water treatment plants. The usage is much less than the 598,000 kilowatt-hours consumed by the arena annually before an energy refit in 2012, and while a good chunk of that reduction came about because the city stopped offering ice skating during the summer, it’s still a real improvement. 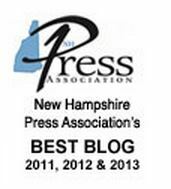 Bardwell has been in this business for decades, and has been in Concord since 2003. Plenty of technology changes have come about, but basically the process of chilling brine and sending it through pipes under the floor is still the way that even the high-techiest of ice rinks does it. Until somebody invents the refrigeration equivalent of the microwave oven, that’s unlikely to change. This ice is painted white, using a special formulation known as “ice paint,” which Bardwell looks like a flour mix. Then another eighth of an inch of ice is applied, and the hockey markings are painted. Bardwell said the blue-and-red lines are marked with colored yarn to align them before being painted, while the semi-circular crease is painted via a process that sounds like a human-sized version of those circle-drawing compasses we used in high school. Then more ice is put down by hoses – deep enough that the studded tires on the Zamboni won’t crunch through and grab the yarn – before the Zamboni itself takes a whole bunch of passes, placing layer upon layer of ice before the final thickness is reached. Another point, Bardwell noted: The middle of the rink gets worn down much more than the edges and the corners, so special scrapers are needed to run occasionally, to even out the surface. Knowledgeable skaters know to look around the bottom of the inner wall to see whether there’s a consistent amount of kickboard visible, which is a good measure of whether the ice is flat. Finally, one more point. Bardwell says Everett Area is not the coldest arena in New Hampshire, as I have been told by more than one shivering parent. The Pop Whalen Ice Arena in Wolfeboro is colder, he said.